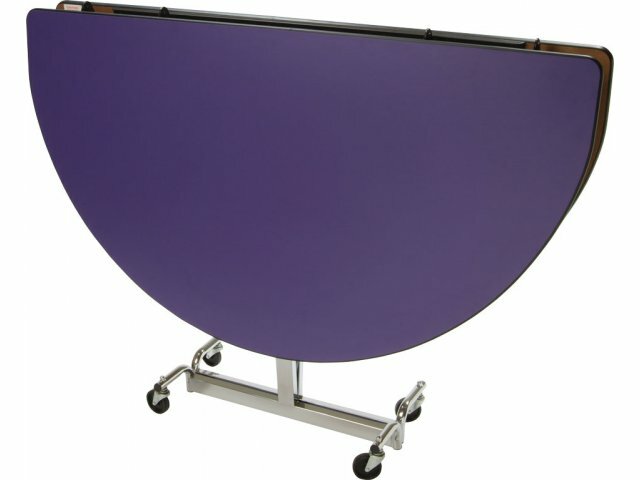 Mobile Oval Cafeteria Table - Chrome Legs 60x66"
Seat your students in style with this oval cafeteria table from Mitchell Furniture Industries. The durable, chrome-plated frame will last for many years to come. Mitchell Fold-N-Roll cafeteria tables are unique in that they feature recessed legs for unencumbered seating all the way around the table. 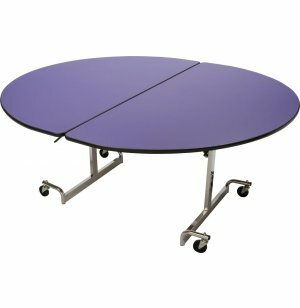 Mobile cafeteria tables are convenient in that they allow you to move and store your tables quickly if you need to use your cafeteria for a special event. They also make cleaning cafeteria floors easier since they can be folded up and pushed aside by one person. Just lift the center of the table until it locks securely into place. These cafeteria tables roll on non-marring, heavy-duty casters to keep your floors looking great, but they rest on steel supports (not casters) when in opened position. Mitchell Furniture manufactures a highly varied line of quality folding tables and table systems for a wide range of applications. Innovative designs, creative solutions and a strong commitment to quality have made Mitchell an industry leader. 16-Gauge Steel, 1" X 2"
Plenty of Leg Room: Table legs are set in allowing unobstructed leg room for those seated anywhere around the table. 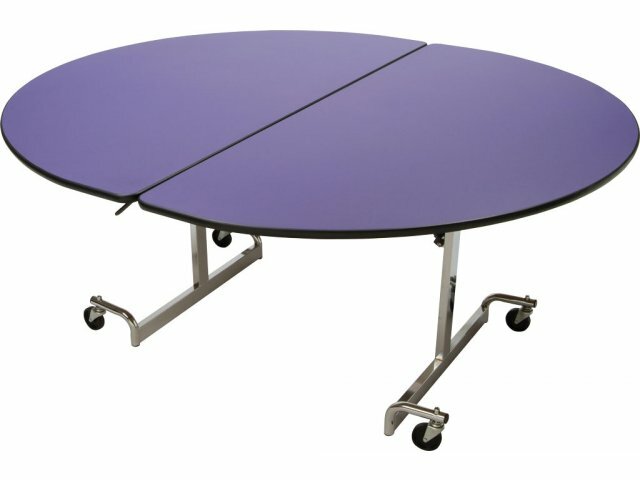 Mobile: Tables fold up and can be pushed on four non-marking casters. Safe: Frame-mounted lock secures tabletop both in folded and unfolded positions. Durable Tabletop: 13/16-in. thick tabletop consisting of High-Pressure Laminate on 45-lb. density particle-board. Environmentally Friendly: Mitchell table components (Wilson Laminates, adhesive and board) are GreenGuard certified. Wheelchair friendly: Meets ADA requirement for knee clearance (19 in.). School Spirit: Give your cafeteria a personalized look with custom logo printing. Call 888-793-4999 for details.